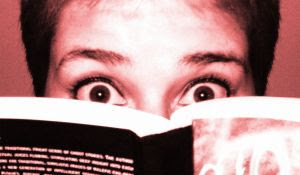 Stellar Four: Suggestions Wanted: What's the Scariest Book You've Read? Suggestions Wanted: What's the Scariest Book You've Read? What would you suggest to give an adult reader a good case of the creeps? Hit the comments! This is Knight_of_Pentacles from io9. I'd have to say that "Pet Cemetary" by Stephen King was probably one of the scariest books I've ever read. You know that what the characters are going to do is really bad, and then it turns out even worse than you expected. On a more disturbing, making you wish you had brain bleach level, is almost anything by British author Clive Barker. I'd recommend his "Books of Blood" or the unfinished "Books of the Art" series consisting of "The Great and Secret Show" and "Everville." I wish I could get the image of the Vlad Oborous striding toward the characters across the dream-sea Quiddity out of my subconscious . . . I'd go with Martin Lastrapes' "Inside the Outside," a literary novel about cannibalism that goes past horror and into terror. Lastrapes effectively creates an atmosphere of dread through simple, fluid prose and a great structure. Highly recommended. I am skincrawlingly petrified of Shirley Jackson's classic "The Haunting of Hill House". It's atmospheric and intensely creepy. Ghost Story - Peter Straub. That is all. When I was a tween (of course, it wasn't called that back then), I LOVED all the Christopher Pike books, the Scary Stories to Tell in the Dark series, and a little later on, Stephen King's play,Sorry, Right Number. I don't read a lot of horror now, but the last story I read that I found actually disturbing was Coraline when it first came out. "Salem's Lot" by Stephen King was the only book ever to actually give me nightmares. But... "Blindsight" by Peter Watts is the most horrific book I've read recently. It's the best annotated fiction book I've ever read; he cites his sources and they're real sources, which truly creeped me out. I have to go with Ms. Wench on this one: I read King's SALEM'S LOT in the 1970s while living alone in a tiny one bedroom apartment. Reading late one night I finally had to get up and turn all the lights on. And her description of Watt's BLINDSIGHT as horrific is credible as well. I'm so glad I'm not the only one who was completely unnerved by 'Salem's Lot. Honestly, Bram Stoker's Dracula is intensely creepy, especially given the time period. The descriptions of the Count's off-putting behavior, the constantly changing narration, and the overwhelming uncertainty all combine to give me the wiggins. Not to mention it is one of (if not the) original vampire novels. House of Leaves by Mark Z. Danielewski. Terrifying! Don't laugh, but I'd also suggest R.L. Stine's The Fear Street Saga (The Betrayal, The Secret, The Burning). Plus, all three can probably be read in a single night. and I ended up only reading it on the school bus, broad daylight, lots of noisy kids. Ugh, The Road. I promised myself that I wouldn't ever go back to that mental place again. I was more depressed than scared, but it most certainly had a lasting effect. I don't know how I've never read The Shining. I'll need to rectify that. And I love the thought of scary sci fi (as well as free ebooks), so I'll check out the Peter Watts, too. Lots of great ideas for my list!